An elegant and satisfying dark chocolate experience, with rich European sophistication. Dark Chocolate Hot Cocoa indulgence at the touch of a button! -Store Dark Chocolate Hot Cocoa K-Cup packs at room temperature. 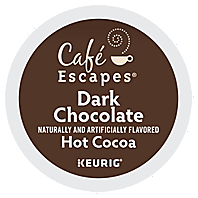 -Run a hot water brew cycle (without a K-Cup pack) after brewing Dark Chocolate Hot Cocoa. Our cocoa brews hot! Always test before serving to young children.